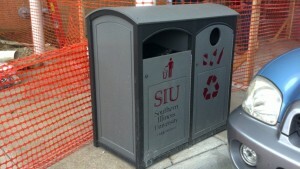 SIU has a variety of recycling containers on campus. Below are examples of the types of containers that collect recyclable waste to be repurposed. 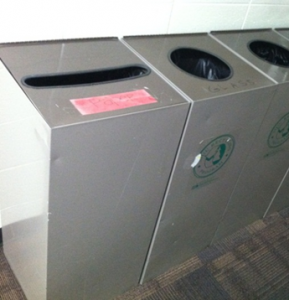 Housing – Placed prominently on every residence hall floor are these metal recycling bins for our residents to use. By having these available to our residents in the place they call home, we are aiming at fostering a sustainable attitude that lasts a lifetime. 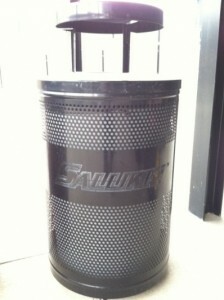 Academic Buildings – In each of our academic buildings there are these handy containers for your used bottles. 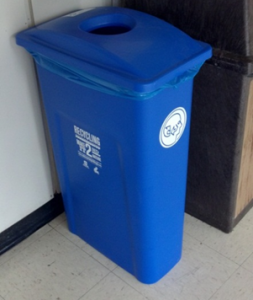 Help keep your academic area environmentally friendly by choosing to recycle before, during, and after class. Student Center – The student center offers a wide variety of student services, and as a result can create a lot of unused materials. 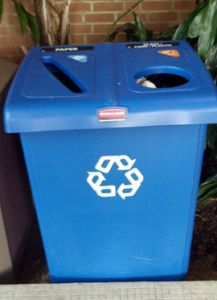 Be sure to utilize these recycling bins positioned all across the student center. They have dedicated bins for paper and bottles. Athletics – While saluki athletics are doing their part to entertain on the field of play, do your part in keeping it clean! Use these recycling receptacles located throughout our athletic facilities. Outdoors – While enjoying the scenic landscape of Southern Illinois University’s campus, be sure to keep an eye out for these bins. To keep our campus looking as picturesque as possible, be sure to use these outdoor recycling units.